As you can well tell, book #1 is winding down (current estimate puts January 5th as the last page), and then on to book #2. But with that, as well as with the new year, I will probably do a small overhaul of the Spacetrawler web page. And if you have ANY suggestions, let me know! I’m considering removing the “iphone” version (does anyone actually use this? ), having prints for sale, making the strip image slightly larger, and a general visual overhaul. Thanks for the re-blog and many comments/re-re-blogs of Ripley over at FYSF! That’s it today. Have a Happy Solstice and a Merry Christmas/kwanzaa/Hanukkah etc, I hope Santa is kind enough to not bring you coal! also YAY Martina as captain! Martina’s captain?! She could get killed! I have to agree with Krep. Ceding command for your first order doesn’t show a lot of leadership. Loyalty, sure; but not leadership. @Frank, unfortunately, no. What with nursing a sick cat and my girlfriend for two months this autumn while also getting ahead on Spacetrawler for my 20 day trip east for NEWW and to see family, I was unable to get it out to many publishers or agents. So, unless Christmas miracles happen, I’ll be self-publishing. I do, sometimes, read the iphone version. Also, panel 1 : “the first one’s” or “the first ones” ? I primarily use the iPhone version, but I can’t imagine it’d be a huge loss if it disappeared. Pannel 10. “…Captain?” Is my favorite Krep pannel yet. 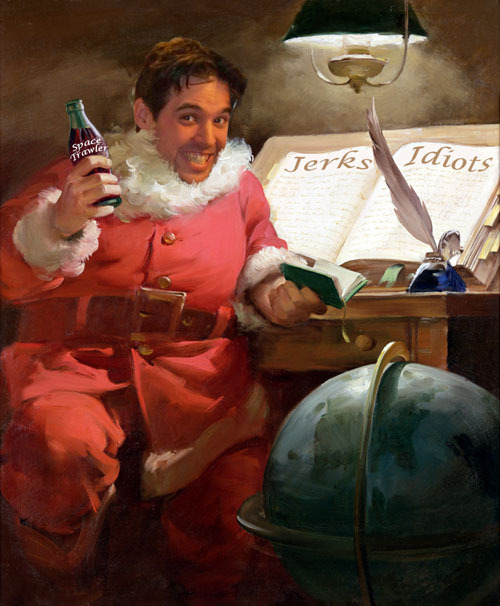 (Followed closely by the one where he’s throwing the can of soda at Dustin’s head) Merry Christmas, Chris! Okay, seems the iphone version gets used. The main reason I would consider dumping it (aside from it being a little less work) is that then I could do panels more than one row tall, such as big 1/2 page splash panels. I mean, the whole iphone version is a neat idea, and I almost imagine it would set it up for future flexibility regarding formats, but part of me wonders if that’s just me being nutty. Wait so how will Pierrot survive? Potty bots can synthesize food? @Tuss4, Peanut Butter and Jellies of course! Oh sure…the hand joke *is* here. Yeah, I foreshadowed that… like 2 minutes ago… ha. In panel 2, it looks like Yuri is sporting a Rudolf nose! @Wood & @Prairie, fixed! Thanks for the heads up. Wow, the iPhone version is actually higher resolution! I’d avoided it because I thought it would be lower (like with some wordpress-based comics I read). I will totally use it from now on. I love the iphone version. I wouldn’t be devastated if it went away, but I do use it regularly. I like the iPhone, but, ideally, it would be the same web address each day. That way I could bookmark it and go directly to the strip instead of seeing a small preview that occasionally spoils the surprise. Hey @DJ, maybe I can put the “iphone” link at the top of the page. Yes? “That’s no way to talk about your captured captain.” Of course, that’s how Krep has always talked to Nogg. When it comes down to it, though, Krep cares. Dude, finding a signifigent other is way more important than a publisher. Good on you. There’s something beautiful about keeping to the square panels of the comic format, whenever I look through a body of work of an artist, and I see regular square panel layouts of the action and the dialogue, it shows a lot of thought, angles, dynamic placement of action and some regularity that in it self shows how the layout proceeds in a way that follows the storyline. Gurnikrigg Court is one that, in my view, sensibly explores changes with comic panel options, as does Girl Genius, Frank Miller in ‘The Return of the Black Knight’ was a classic type that I keep returning to for that. The ‘Landscaper’ is a webcomic that has fallen away horribly from failings to follow a page layout theme. Megatokyo is interesting, but insipid in this regard, Dr McNinja is eratic and it does not contribute to the storyline progression – but that’s Dr McNinja, so would this even be a thing to consider? For example, Allan Moore’s ‘V for Vendetta” as a long discussion on the decision to use frameless panels and un-outlined word balloons throughout the comic for a particular effect. The use of an implied frame there was a stylistic one that had repercussions on the oppression of England at that time. In my view, please keep the simple, yet stylistically powerful, panel format.